Mama has found a new teeth cleaner…aka gum with xylitol! 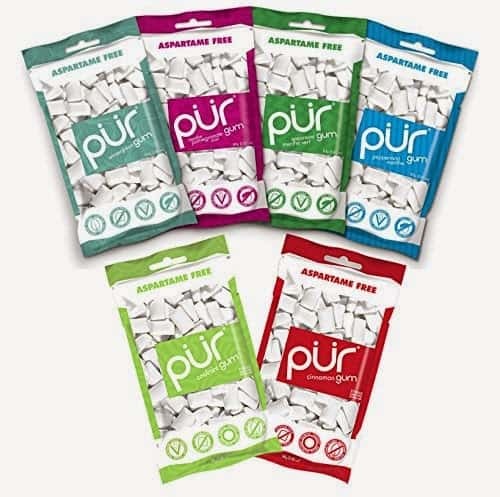 No chemical aspartame and vegan, gluten-free, non-gmo, nut-free, diabetic friendly and dairy-free. Did you know that most mainstream gum often contains milk?! Crazy. So my boys didn’t have gum for a long time. After my boys had horrendous dental check-up’s a few years ago, I started cutting sugar and looking for pro-tooth health products. I found that gum with xylitol was a great way to keep the mouth clean, and it could be found in products like gum. Since my boys desperately wanted to chew gum, this was a great idea for us! First, we loved Trident Original gum with xylitol. But it also has aspartame! I wish I had known that sooner. No thank-you chemicals. Then one day I found PUR at the local market, and it seemed to fit the bill for what I wanted. The boys really liked it. We stock up at Amazon, and can get all 6 of the flavors!